Dr. Charles Haynes, Director of the Religious Freedom Center and Vice President of the Newseum Institute, delivered an overview of the First Amendment to the United States Constitution and its central role in protecting the free exercise of one’s faith in America’s public square. 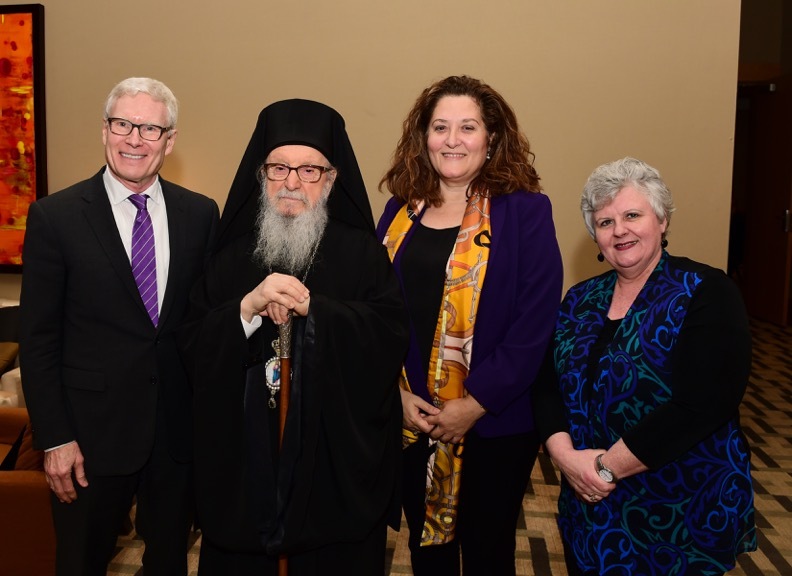 He encouraged the hierarchs to study how Orthodox Christianity is presented in the public square, especially in the textbooks of our nation’s public schools, and shared his hope that seminarians be educated in the area of religious freedom. Dr. Debra Mason, Professor of Journalism Studies at the University of Missouri School of Journalism and Curriculum Specialist at the Religious Freedom Center, presented on the subject of religion in the media. She highlighted the unique challenges facing the church in utilizing digital media platforms to reach the faithful, especially millennials. Dr. Elizabeth Prodromou, Visiting Associate Professor of Conflict Resolution at the Fletcher School of Diplomacy at Tufts University, delivered a presentation on the international status of religious freedom. Professor Prodromou offered a primer on the deep historical footprint concerning religious freedom, noting the central role of religious freedom in the life of all people. She called upon the hierarchs to engage the American public as social critics; to mine the theological resources of Orthodoxy to better understand and defend religious freedom; to engage in catechesis with the faithful on this subject; to support religious freedom for all people; to develop partnerships with other religious groups in the propagation of religious freedom; and to stand against totalitarian ideologies wherever they may be found. With the end of the two three-year terms of service of Bishop Basil and Metropolitan Antony as Secretary and Treasurer, the Assembly elected His Grace Bishop Gregory as Assembly Secretary and His Eminence Archbishop Michael as Assembly Treasurer. The Assembly spent considerable time reviewing the work of its committees and recommended ways to advance their work. His Eminence Metropolitan Methodios, Chair of the Committee on Canonical Affairs, updated the assembly on the effort to establish a common clergy database, which would provide hierarchs immediate access to the ecclesiastical status of every Orthodox clergy across the nation. His Eminence Metropolitan Savas, Chair of the Committee on Church and Society, expressed hope that the committee might be more active in the future. His Grace Bishop Demetrios, Chair of the Committee on Ecumenical Affairs, reviewed the ongoing theological consultations and commissions. His Eminence Metropolitan Isaiah, Chair of the Committee for Military Chaplaincy, reviewed the possibility of designating the Assembly of Bishops as the religious organization to the US Defense Department and as the common Orthodox Christian Endorsing Agency. His Grace Bishop Thomas, Chair of the Committee for Youth, updated the Assembly on the continued work of the committee and expressed gratitude for the Assembly’s ongoing support of the various youth activities and for once again endorsing the annual Youth Worker and Camping Conference, slated for January 2017. His Eminence Archbishop Nicolae, Chair of the Committee for Canonical Regional Planning, presented a detailed report on the regional study of jurisdictional collaboration in Texas, New Mexico and Oklahoma. The study revealed that grassroots parish collaboration may lead to greater pan-Orthodox unity through the establishment of local parish networks. These networks may enhance our ability to address common interests, needs and concerns, and may provide opportunities to share ministries and resources.